FAQs for counselors – Deaf Camps, Inc.
No, all of our counselor and director positions are 100% volunteer. If you want to volunteer with us, click here or read on for more information. Manidokan, the facility where Deaf & ASL Camp is held, does have paid positions for summer staff. Click here to learn about Manidokan’s job openings. What is it like to volunteer at Deaf & ASL Camp? Amazing, challenging, inspiring, exhausting, rewarding, HARD and FUN! Each camp is staffed by counselors who are deaf and hearing, from new to fluent signers. Our campers are diverse: some have attended camp for many years, some are away from home for the first time; some have special needs and will need accommodations or perhaps a one-on-one; some will be experienced signers and some will be just learning their alphabet. Our campers come from hearing and deaf families, from all over Maryland and beyond! We often have families who send siblings, cousins, and even neighbors so that their children can enjoy camp together. You will swim, raft, hike, play, and laugh alongside your campers. You will be exhausted, dirty, and challenged. You will be sick of the bugs and might wonder why you bothered to bring a novel to read. We also hope that you will learn more ASL than in any course, get to know many amazing kids, and take in the truly awesome scenery around Manidokan. Many of our volunteers end the week feeling physically tired but emotionally recharged. These wonderful people return to camp year after year, proving that this is the best week of the summer not only for the campers, but also for the counselors! What are the advantages to volunteering with DCI? How do I apply to volunteer at camp? participate in a telephone or videophone interview (if requested). receive a confirmation from one of our directors inviting you to volunteer in their camp. Why wasn’t I selected to volunteer at camp? There are many possible reasons. We look at the factors above when deciding who to accept. If an applicant has volunteered with DCI at a fundraising event, we also consider their conduct there (promptness, maturity, responsibility). The Office of Retreat and Camping Ministries (which owns and operates Manidokan) is required to perform a background check on each applicant. 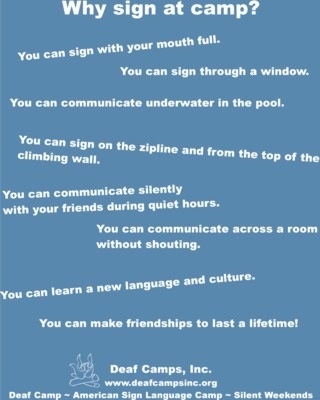 I don’t have that much experience with ASL/kids/camp… can I still volunteer? One individual rarely meets all of the criteria, but we do strive for a balance in each group. If you are weak in one or more of these areas, but you still feel a desire to learn new things and contribute to our program, please send in your application! I’m not Methodist/I’m not Christian. Can I volunteer anyway? YES! We welcome campers and counselors of all religious backgrounds. Parents can request for campers to be excused from morning Bible Study and/or Evening Chapel. You will likely be asked to supervise campers during these activities, but you are not obligated to participate. All counselors are expected to model respectful behavior at all times, including respecting diversity. If I am selected, what should I bring to camp? We have a limited number of spots available for Interpreting Interns. Please click here for more information. Can my child also attend camp? Will I get a discount on my child’s registration? Yes. If you volunteer as a counselor for the week of camp, you will receive a discount off one child’s registration for one week of camp. You may apply this discount to any one week of camp in the same summer at Manidokan. This discount only applies to your own child’s registration, not for siblings, nieces/nephews, or a friend’s children. Policies regarding registration and discounts are set by the Retreat and Camping Ministries Office, not Deaf Camps, Inc. For more information, please contact the Camp Registrar at (800) 922-6795 or camp.registrar@verizon.net. In most cases, we strongly recommend for a parent or family member to volunteer in a different camp than their child. This allows you to focus on your responsibilities and allows your child to experience some structured independence during camp. If you believe this will not be possible for your child, please e-mail us at DeafCampsInc@gmail.com. I can’t volunteer as a counselor, but I still want to help. How can I support DCI? We provide a list of camper first names and the camp address. You provide a letter from a “Secret Pal” to ensure that each camper receives at least one letter while they are at camp. You provide proof of insurance and driver’s license. We match you with a camper who needs a ride to Manidokan on Sunday when camp begins. Help us spread the word about our fundraising events. Volunteer for a fundraising event. Host a “sign and dine” restaurant fundraiser in your area. Solicit donations from church or civic groups you have connections to. Tell everyone you know all about camp. Help bring in more donors, counselors, and of course – campers! E-mail us at DeafCampsInc@gmail.com to tell us how you’d like to help. I’ve volunteered as a counselor, but I want to do more. How can I support DCI? Consider helping the DCI board on projects like fundraising and advertising. E-mail us at DeafCampsInc@gmail.com to talk about how you can add your talents to our group.